Lesnar doesn't play by the rules. Here’s the hierarchy in the WWE in ascending order – jobbers, lower mid-card, upper-mid-card, main event talent, Brock Lesnar. The WWE Universal Champion is not your average WWE Superstar. He isn’t just another talent on WWE’s payroll either. He probably has his own rulebook that even he fails to abide by from time to time. And nobody, not even Vince McMahon, it seems, can assuredly have his way over the former UFC Heavyweight Champion. 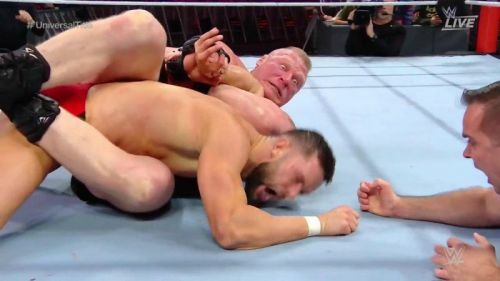 Now, this shouldn’t be construed as a statement to undermine the talent and value of Lesnar, no; the Beast Incarnate is one heck of an athlete who has the quintessential ‘IT’ factor. Lesnar’s bulldozing persona has only been enhanced by the wizardry of Paul Heyman on the microphone. Additionally, the monster booking afforded to him by the WWE Creative rounds up a character that has an accentuated sense of realism about it in the carefully scripted realm of the WWE. It was the August 15th, 2016 episode of Raw and Heyman was in the middle of the ring with his esteemed client to send a message to Randy Orton prior to the now infamously bloody SummerSlam match. Lo and behold, the hottest free agent in sports entertainment at that time, Heath Slater came out to the surprise of the fans at Corpus Christi. He begged for a chance to face Lesnar, as a win would have gotten him a spot on the Raw roster. Heyman no-sold and commanded the cameraman to ignore the former 3MB member. Triggered! Slater snapped and said that he needed this match as he had two kids to feed. As revealed by the Wrestling Observer Newsletter after the show, the aforementioned line was not part of the script handed down to the Beast. Brad Maddox would have been biting his tongue watching this somewhere as he was fired for saying ‘cocky pricks’ during a promo. Funny thing is that it was a dark segment for a SmackDown taping. You get the bail if you push the ticket sales!